Carrying-out a SWOT analysis in which we will identify the strength, weaknesses, opportunities and threats of the company. 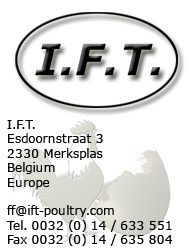 The owner and or financiers want to know how good or bad his investment is doing , IFT-POULTRY can handle this control-evaluation using hereto the SWOT Analysis method. The result form this analysis and control will provide illuminating information on the status of the company; It will be guideline for future decision influencing the health of the company. What do you do well ? What is done badly ? What should be avoided ? Where are the good chances facing you ? What are the interesting trends ? Are the required specifications for your business , products or services changing? you have bad debt or cash-flow problems?